TOUCH OF CREATION: Water colors!! These are ALL beautiful, Piali!! Amazing cards! Thank you for entering TIOT's! These are so pretty. 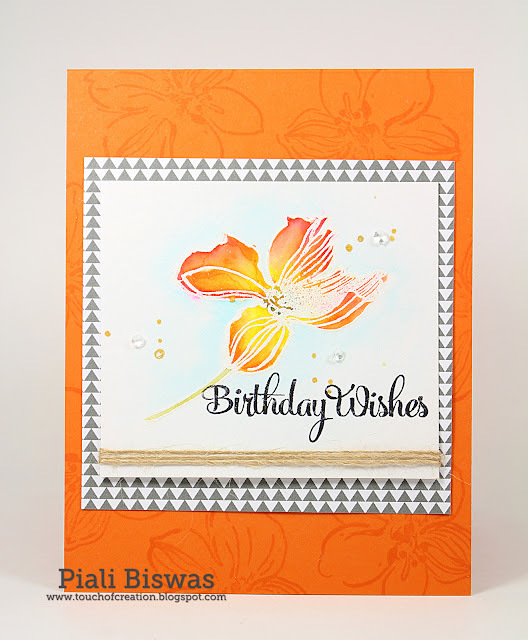 I really like the softness of the embossing and the water color. Wonderful design!! Beautiful water colour style cards. Thank you for joining us at TioT's this time. Your creations are lovely! Thanks for joining us at The Sisterhood's 'Rainbow' challenge! Beautiful cards Piali! Love them all!!! Thanks so much for joining us at The Sisterhood’s ‘RAINBOW’ challenge and please come back again soon! Wow! What a gorgeous set of water colored cards! All of them are stunning!! These are all absolutely gorgeous - you certainly have the skills to work with this medium!! Thank you for joining in our Things with Wings challenge at Fab'n Funky. How lovely and delicate , love your colours and the watercolouring is fab. All three cards are beautifully colored and designed. Thanks for joining us at Melonheadz Friends. Gorgeous card! Love the vibrant orange! Thanks for joining us at TioT challenge. Both of these cards are stunning! Beautiful work. Thank you so much for entering our ATG challenge at Through The Craft Room Door this week. We are looking forward to seeing you again in the next challenge. Oh, WOW!!! These are absolutely gorgeous!! Love that watercoloring; specially love that first one with the gorgeous pink flowers. Thanks for playing with LTSCB. Such a sweet card and great take on the challenge. Thanks for playing with us at TIOT. These subtle colors are so pretty - on each and every one of your cards. Thank you for your entry into our anything goes challenge at Love To Scrap. Gorgeous use of the Wild Hibiscus set! Love these! !